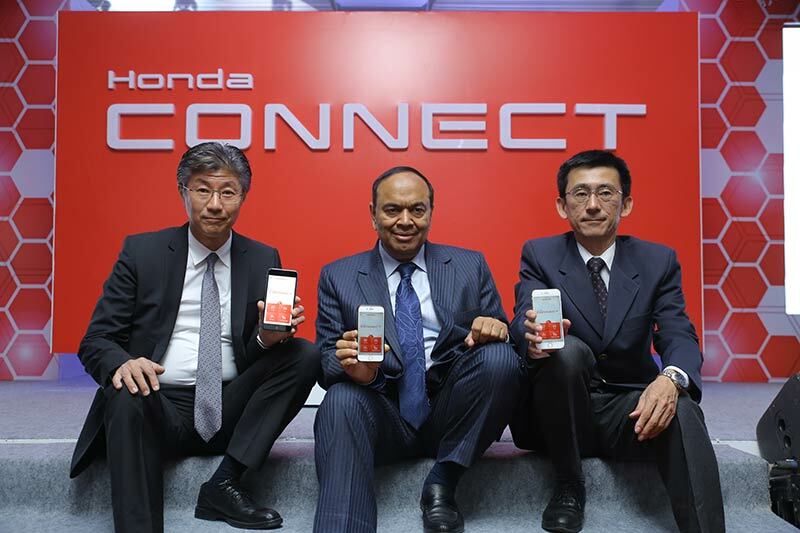 Honda Cars India Ltd., leading manufacturer of premium cars in India, today launched Honda Connect, an intelligent and advanced information platform for customers. 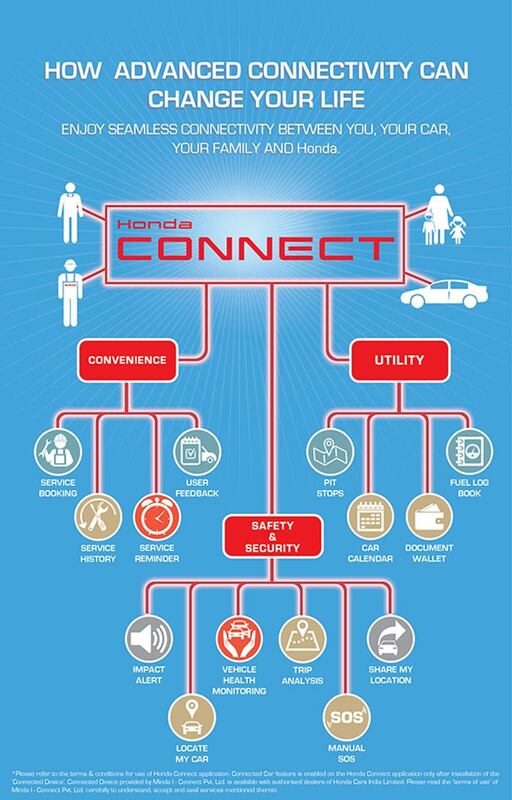 Honda Connect paves the way for advanced connectivity and enables new form of communication between the customer, car, his family and Honda. The Honda Connect platform also supports Connected Car features enabled by a “Connected Device” easily integrated with the car. This will make the customer’s ownership experience more safe, convenient and enjoyable. Honda Connect is an intelligent automotive application for smart phones to form an even closer connection with users. Using smartphones, Honda Connect’s diverse features provide convenient access to detailed information about Honda vehicles and other services. The Connected Car features, supported by Honda Connect, will give Honda customers important information about their car even when they are not with it and provide extreme sense of safety and security. This “Connected Device” to enable the Connected Car features has been developed by Minda i-Connect and is being offered at the Honda dealerships exclusively to all new customers of Honda Jazz, Honda City and Honda CR-V at an introductory price by Honda’s subsidiary for accessory business – Honda Access India Pvt. Ltd.
Today technology has become an integrated part of our lives. The development of Honda Connect is part of our mission to create innovations that best suit our customers’ digital-based life styles. This platform offers a value added communications channel that bonds Honda even more closely with our customers. 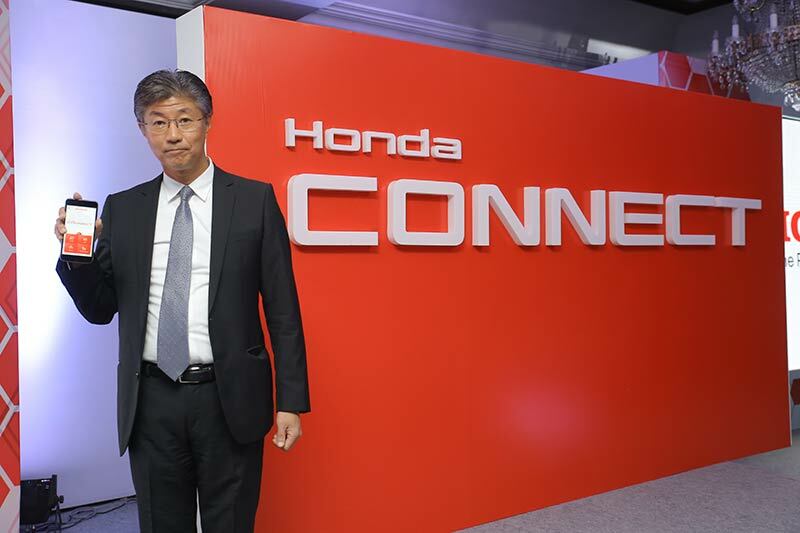 The launch of Honda Connect marks the celebration of HCIL’s 20th anniversary of incorporation in which the company has achieved cumulative sales of more than 1 Mn units. Reinforcing Honda’s image as an advanced technology brand, this innovative information platform will meet the evolving needs of today’s tech-savvy, always-connected consumers and assist them with all forms of Service and Utility support. The Honda Connect application is available on iOS and Android platforms for free download from the Apple App Store and Google Play for everyone in the country. The Honda Connect enhances the Honda car owner experience in many ways and comes with multiple useful features. •Service Booking/ Alerts: The Service features enable a Honda owner to get push notifications about their vehicle’s maintenance. This includes periodic service alerts, scheduling on-line service appointments, building a detailed history of each maintenance action taken on the vehicle, including the visit date, dealer name, cost and so on. •What’s new and Feedback System: Honda Connect provides opportunity to the users to get updates on new products and campaigns being offered by Honda. Also the users can give feedback directly to the company. •Manual SOS feature: In the event that the customers find themselves in an unpleasant situation, the Manual SOS feature, in just a simple click, will let the friends and family know their location. •Pit Stops: It facilitates an effortless nearest Honda dealer search and nearest fuel Station search on a real time basis with navigation assistance anywhere and anytime in country. •Insurance and PUC renewal: Reminders about necessities such as Car Insurance and PUC renewal help Honda owners to ensure they don’t miss anything important. •Document Wallet: The Document Wallet allows the customers to keep important document photos related to their car. •Fuel Log : The Fuel Log records information such as when the vehicle is refueled and shows fuel economy figures, based on the fuel filled and odometer reading. •Impact Alert: The sensor inside the “Connected device” measures the car’s 3D orientation a hundred times in a second and its inbuilt algorithm can detect an impact possibly due to strong jerk, physical knock or collision. The Impact Alert feature activates HCIL’s 24X7 call center Honda One2One to generate an assistance call where the Honda representative will try to get in touch with the customer and then inform their pre-determined emergency contact numbers with the car location so that help can be organized. •Locate My Car: The Locate My Car feature will enable the customer to locate their car at a single click as the device picks the car’s location every few seconds. •Trip analysis: The Trip by Trip analysis will provide all the information and statistics that the customer needs to optimize their driving behaviour including route taken, Average speed and Idling time. It will also let them know the stops being made or harsh driving which will reassure them in cases when their loved one are being driven or driving their cars. •My Car’s Health: This Vehicle Health Monitoring feature, in case of technical trouble related to engine and battery, will display the car trouble code along with its description. In case of any Defect Troble Code (DTC), the customer will also get timely advice and assistance from the Honda’s customer call center on 24X7 operation including route to the nearest dealer. •Share My Location: A safe and fun feature, Share Your Location, lets your friends and loved ones know the exact location of your car in realtime. You can create sharing sessions from 15 minutes upto 12 hrs.